Oh. My. Goodness. 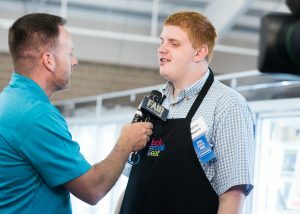 You guys, I’m still on a high from Wednesday’s cooking competition at the Iowa State Fair. Charlie and I arrived at the Elwell Family Center, where all of the food competitions take place, not really knowing what to expect. I knew we had about 25 people signed up to enter their recipes in the contest, but after that, it was up for grabs. Well. See that crowd in the photo above? That’s what Standing Room Only looks like! Friends and family of contestants, fans of LCE, and probably a few hangers-on from the enormous cookie competition prior to our contest filled the seats. So very cool. We were off to a good start! While we waited for the cookie contest to wind down, TV stations started asking for interviews. It was awesome talking with Iowa Public Television and WOI We are Iowa, both terrific supporters of LCE. Watch the IPTV coverage here (we’re at the 32-minute mark); check out the WOI interview here. Finally, it was time! The people packed into the room were anxious for the judging to start — a lot was at stake: the first place finisher would take home $500 for themselves and $500 for an organization of their choice that services people with special needs. Second place won $200 and some very fine LCE swag (a chef’s coat and an apron), and the third place winner won $100 and more LCE swag. Each of the judges — me, Charlie, and LCE friend and supporter, Andy — was presented with six entries to taste and analyze. There were 18 entries total ranging from salads and appetizers to soups and even desserts! I was blown away by the creativity on display, and of course, everything tasted great. Once we each sampled our six dishes, we took the top ones from our groups and then went in the back, tasted again, debated a little bit, and made our final decisions — that was the toughest choice I’ve had to make in a while! You might recognize John — he’s been on Facebook live several times and has done some promotional video work with us. John lives in Johnston, Iowa, with his family — John’s mom, dad, and three brothers are often treated to dinners that John makes from LCE. 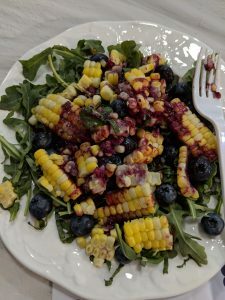 I loved this salad for its uniqueness and delicious flavor. These were impressive! Besides tasting yummy, if you’ve ever made egg rolls before you know that they can be kinda fussy — rolling them isn’t exactly easy. But Joy nailed it! 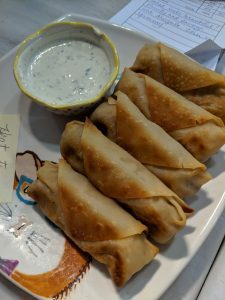 Joy attends Roosevelt High School in Des Moines, and I’d love to have her visit the LCE studio sometime to teach us how to make her egg roll recipe! Corn? In cookies?? Absolutely! 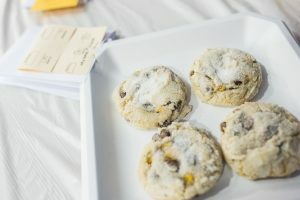 These were so delicious and certainly took the cake (cookie?) in the originality category. They were submitted by 17-year-old April Olson from Knoxville, Iowa, and the giant smile she flashed when she found out she’d won was so special. I’d love for her to come into the studio too and teach me that cookie recipe — seriously, it was unlike anything we’d ever tasted. 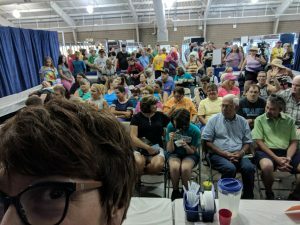 So to say the Super Special Corn Creations cooking competition at the 2018 Iowa State Fair was a success is an understatement. It was absolutely everything I dreamed it would be, and I can’t thank all the contestants enough for entering and putting themselves and their recipes “out there” for the world to see. That can be a scary thing, but everyone did such an amazing job and I hope you’re all super-proud of yourselves. Please keep cooking and trying new things. And start imagining your entry for next year! I’d love to see everyone who entered return next year along with lots of new faces too. 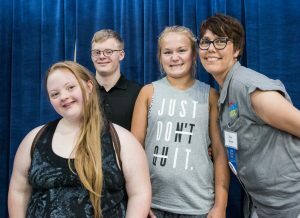 Thank you, too, to the Iowa State Fair and Foods Superintendent, Karen McKilligan, for helping make participation in the fair’s activities inclusive for all Iowans. Judging by the number of contestants who signed up and the turnout and interest in the event, this is the type of thing that the world loves and needs more of, don’t you think? Wouldn’t it be awesome if every state fair in the country had a competition like this? Any other states already have a competition like this! We’d love to hear about it! Finally, thanks, too, to Jess Dean for her amazing photos of the event — she took so many great shots that we can’t share all of them here but be on the lookout for them on social media in the next few days and weeks. My thanks as well to Jenna Bieri, our social media maven, documenting the competition in “real time” and making sure those photos are seen by our followers. And to our judges, Charlie Flippen, an awesome advocate for LCE and all people with different abilities, and to Andy Lyons for judging our competition right after tasting a bazillion cookies! Join me in congratulating all the contestants for participating and being part of this great event! We will see you next year at the Iowa State Fair!